Glenavon’s rearranged New Years Day fixture at home to Newry is now being played on Tuesday 2nd February ko 7.45pm. Clubroom opens 6.45pm. Find the Joker snowball will be £500. Glenavon travel to Ballymena Showgrounds on Saturday in need of vital league points. Bus leaves MVP at 1.15pm and Moira at 1.30pm. The Club sponsored Saturdays IPL game v Cliftonville. 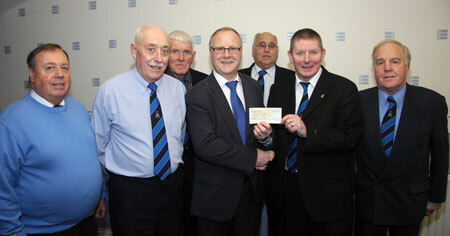 Chairman Nobby Davidson presents a cheque to Hubert Watson. There is the possibility of the Lisburn Distillery game being moved forward to TUESDAY 19 JANUARY if both clubs agree and have no Irish Cup replays. You are currently browsing the Glenavon Triangle Supporters' Club blog archives for January, 2010.